Nintendo isn’t leaving the popular Princess Peach out of the themed Wii Remote fun after all. This morning, they revealed a pretty pink Peach Pink Wii Remote Plus to accompany the previously released Mario red and Luigi green controllers. The new Wii Remote Plus is compatible with the Wii and Wii U and will hit stores later this month for $39.99. Nintendo hereby announces a new Wii Remote Plus controller styled in the royal fashion of Princess Peach. The pink controller features many touches that pay homage to the Mushroom Kingdom’s most powerful heroine, who recently starred in the Super Mario 3D World game for the Wii U console. The new controller includes a crown design over the speaker, blue buttons that echo Peach’s royal jewelry and a golden-yellow plus pad that evokes her regal crown. The new Peach Pink Wii Remote Plus will start appearing in stores in late April at a suggested retail price of $39.99. It joins other controllers themed to Nintendo characters, including the red Mario and green Luigi controllers. 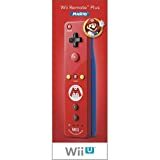 Wii Remote Plus includes Wii MotionPlus technology, and works with all Wii and Wii U games that call for Wii Remote controllers. Fans of Mario Kart 8 might want to pick up the new remote to control Peach when the game launches May 30.